It was noted that Edward VII tried to make the British Royal Standard more personal by restricting its use. How did he try to restrict it? During the reign of Queen Victoria, the Royal Standard was considered to be the Standard of the United Kingdom, and not the Standard of the Sovereign. It was used by members of the Royal Family; flown at certain military parades; displayed on fortresses and official buildings in the United Kingdom, and at Government House in the colonies, on the Sovereign's Birthday and on the days of Coronation and Accession; and flown on government buildings when the sovereign was passing in State. It was also flown by private individuals and organisations who thought that it was an appropriate way of displaying their loyalty to the crown. When the Prince of Wales became King Edward VII he tried to introduce a Royal Standard differenced with an oval shield in the centre carrying his cypher and crown on a purple ground. It was to have been for his exclusive and personal use alone, with misuse guarded against by the Trade Mark Act of 1883. However the Board of Trade, who were responsible for trade marks, wrote that changes to the Royal Standard were not within their competence. The Law Officers thought that since the Arms and Standard had been created by the Act of Union with Ireland, any alteration to the Royal Standard would probably require an Act of Parliament. This was thought to be unfeasible, and the proposal was abandoned. As an alternative, measures were taken to restrict the use of the Royal Standard. The Home Office noted that the King was aware that legally no one could be prevented from flying the Royal Standard, but he wanted it to be discouraged. In 1906 the Admiralty and War Office issued Circulars that the Royal Standard was not to be displayed on fortresses and official buildings on King's Birthday, etc., but only when the sovereign, was present in person. To avoid contentious legislation, restrictions on the use of the Royal Standard by private individuals were promulgated by Circulars to Police Forces. In the course of 1907 instructions were issued by various government departments canceling existing orders, and directing that the Royal Standard was to be flown on government buildings only when HM was within the building. Home Office and Scottish Office Circulars stated that the Royal Standard could not properly be used without HM permission, and that persons should be asked to discontinue its use, and the Secretary of State informed of any refusal. It was acknowledged that the instructions could not be enforced, but it was hoped that the restrictions on its use could be achieved by appealing to the people's sense of good taste. In 1908 it was reported that action (unspecified) was taken against persons or bodies reported for flying the Royal Standard. In a letter to 'The Times', the Earl of Crewe wrote that the belief that the Royal Standard could be flown anywhere, by anybody, was incorrect. By the time that George V succeeded Edward VII in 1910, it had become generally accepted that the Royal Standard of the United Kingdom was the sovereign's personal banner. MEPO 2/1070; WO 32/16192; WO 32/14,700; WORK 21/6/9. Was the restriction on use of the Royal Standard what prompted the widespread use of the Union Jack, or was that a result of Jubilee celebrations a few years earlier? It is hard to judge what impact the restriction had. The Union Jack replaced the Royal Standard in the relatively few places/occasions where the latter was no longer permitted. The publicity, if there was much, may have raised the profile of flags, and encouraged the idea that the Union Jack could be used by the general population, as well as being an emblem of the state. Why would an act of Parliament be required to alter it, when it had been altered in Victoria's time (removing Hanover, etc.) and before (elector to king, etc. ), but after the Act of Union? To the best of my knowledge an alteration to the Royal Standard would not need an Act of Parliament. Such things are done through the Earl Marshal, I believe. It was only a legal opinion, not definitely established, that an Act of Parliament would be required. Before 1801, I assume, the royal arms and standard were the concern of no-one but the Monarch, the Court, and the College of Arms. This changed when the alterations to the flag and arms in 1801 were instituted by an Article in the Act of Parliament that created the United Kingdom of Great Britain and Ireland. The changes that modified, and then removed the Hanoverian escutcheon, were, following the advice of HM's Privy Council, declared by Royal Proclamation. The perceived problem with Edward VII's proposal was, not that it would have changed the standard, but that it would have created a new standard, along side, and derived from, the existing standard. I wrote when this first came up "that it was one for the lawyers amongst us" and let say at once that I am not qualified to offer a legal opinion. But does the possible requirement for an Act of Parliament not depend upon whether the 1801 Act of Union was formally repealed upon the creation of the Irish Free State in 1921? If it was not, then the power (to select the symbols of the Union) granted to the Monarch under Article One of that Act is surely still operative? I wonder if the legal basis for this advice might have been that, as Hanover was itself not subject to the authority of the British Parliament, the removal of its arms from the British royal arms and standard could not be regulated by an act of the British Parliament. This theory would be weakened if the 1801 act specifically mentioned the Hanoverian escutcheon, of course, but even so it would not be British law that would govern to whom the Hanoverian arms legitimately descended upon the death of William IV. On the other hand, British law would govern the disposition of the basic British (English, Scottish, Irish) quarterings. "... the arms or ensigns armorial of the said United Kingdom shall be quarterly, first and fourth, England; second, Scotland; third, Ireland: and it is our will and pleasure, that there shall be borne within, on an escocheon of pretence, the arms of our Dominions in Germany ensigned with the Electoral Bonnet. And it is our will and pleasure that the standard of the said United Kingdom shall be the same quarterings as are hereinbefore declared to be the arms or ensigns armorial of the said United Kingdom, with the escocheon of pretence thereon herein before described." That particular article in the Act was a package that encompassed the Royal Stile and Titles, the Ensigns Armorial, Flags and Banners, and the impressions on Coins, Dies, Stamps, and Marks; but different parts were treated in different ways. The changes to the arms/standard were by proclamation; "We have thought fit, by and with the advice of Our Privy Council, to declare that henceforth the shield or escocheon of pretence representing His late Majesty's dominions in Germany, and ensigned with the Hanoverian royal crown, shall be omitted, and the shield left to contain the arms or ensigns armorial of the United Kingdom of Great Britain and Ireland only;". "It is a well known constitutional rule that where a power is granted by Parliament to the Crown, that power is exhausted by its first exercise. In accordance with this constitutional rule the various alterations or additions which have been made to the Royal style and title have always been authorised by special legislation ( eg. 39 & 40 Vict. c.10, and 1 Edw.7. c.15 ). It appears to me that any alteration of the Royal standard, on which the Royal Arms are blazoned, would require similar legislation." There was reluctance to undertake legislation that might be opposed in parliament, but concern that adding the King's personal cypher to the standard without any legislation might be successfully challenged in the future. Instead the standard became, by persuasion, the sovereign's personal standard, even though the Act creating it describes it as, "the standard of the said United Kingdom", not "the standard of His Majesty, King of the United Kingdom". What artistic changes have been made to the harp over the years? There have been two versions of the harp in recent times; the winged female, and the Gaelic. Heraldically, either is acceptable, since the blazon calls for a harp, and anything which looks like a harp is correct, as long as it is gold, with silver strings. In 1954 the Queen approved a design of the Royal Standard with a Gaelic harp. At the time, it was thought by some, that this had then become the definitive pattern. However in 1957, when the Ministry of Works asked Garter King of Arms for the design that should be used for the standards that they supplied to the Royal Households, a drawing of a standard with a winged female harp was sent. During this period a question arose about the Standards of Queen Elizabeth the Queen Mother, and Princess Margaret. If the Royal Standard had a Gaelic harp, did these two other standards have to have the same harp ? Garter ruled that it was entirely the choice of the owner of the standard. In general the Gaelic harp tends to be used on shields, as the shape is a better fit, but the winged female harp always(?) appears on the Royal Standards. If a banner is defined as being "Quarterly X and Y," if X or Y change on their own and thus the banner changes, is there an appropriate act? For example, say Scotland decided, on its own (assuming it had that power) to remove the border of its banner. Would the UK's banner change, and if so, how? The Royal Standard is no more nor less than a banner of arms, and would (I assume) normally change automatically when the arms change. Past changes in the Royal Standard have generally (but not exclusively) signaled either, a change in the personal circumstances of the monarch (such as the various Hanoverian alterations and change to the present design), or of the monarch's aspirations (such as when the fleur-de-lis were dropped). 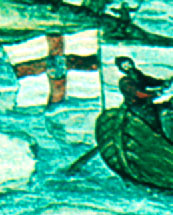 According to Whitney Smith's book on flags, merchant ships from 1606-1634 flew the Union Jack (minus the cross of St Patrick of course) on the foremast and the flag of England (Cross of St George) on the jack staff. He gives four possible positions for flags, going from fore to aft on the ship they are: jack staff, foremast, mainmast, ensign staff. Before 1606 they flew the flag of England from both the foremast and the jack staff. From 1634-1707 they flew the flag of England from the jack staff and a version of the Red Ensign (with the cross of St. George in the canton instead of the entire Union Jack) from the ensign staff. From 1707-1801 they flew the flag of England from the jack staff and the Red Ensign from the ensign staff. From 1801 onward they flew the Union Jack with a white border from the foremast and the Red Ensign from the ensign staff. Wilson (1986), p.34, said that 'This flag (a Union Jack with a white border) was introduced in 1823 as a signal for a pilot in Marryat's Code of Signals for the Merchant Service and later came to be worn as a jack'. He went on to say 'that it is still a legally permitted jack for merchant ships' - which, of course, it is. Based on http://fraser.cc/FlagsCan/Appendicies/Chronology.html, which is an online version of The Flags of Canada, by Alistair B. Fraser, I've condensed a much longer treatment, mostly focusing (as one would expect) on Canada, to cover only cantons/unions in British and related flags. There's also information on French and Viking flags. 1165 - First reference to the use by Scotland of the Cross of St. Andrew. The reference claims that its use goes back to King Hungus in the eighth century. The choice of blue for the field evolved only later. 1277 - First reference to the English use of the Cross of St. George as a flag. 1574 - Ensigns, to be flown at the stern of a ship, were introduced at sea about this time so individual ships could be recognized. In the early ensigns, the field was often multi-coloured strips with St. George's or St. Andrew's cross in the canton depending on whether used by English or Scottish vessels. 1606 Apr 12 - The first, two-crossed, Union Flag is introduced. 1621 - The first red ensign was made and it began to be used by both the King's ships and merchantmen. By 1633 the striped ensigns had been abandoned and Red, Blue and White ensigns were used by the English fleet to denote the three different squadrons. 1649 - Union flag gives way to Cromwell's Commonwealth Ensign. 1674 Sep 18 - The red ensign is specified as the proper flag for a merchant ship. It continued to be used by a Naval Squadron until 1864. The canton contains either the Cross of St. George or St. Andrew, but not the Union Flag. 1707 Jul 28 - The red ensign alone is proclaimed the National Ensign, and all merchant ships were expressly ordered to wear it. The White and Blue Ensigns were looked upon as mere variants for the purposes of naval tactics. 1621 and 1633 accord with Perrin, however, regarding the Blue and White Ensigns. Definite use of the White and Blue Ensigns to distinguish the private ships of van and rear squadrons may be dated from an Order of the Navy Commissioners of March 1653. Such Ensigns were made in small numbers prior to this date, but private ships had almost certainly flown a Red Ensign and had been distinguished by an appropriately coloured pendant (see Nathanial Botelier's "Dialogues about Sea Services" written c1634, Perrin and Wilson). The only surviving union jack from the Battle of Trafalgar could fetch �15,000 at auction after it was found in a drawer, auctioneers say. The flag was flown from one of Nelson's warships, HMS Spartiate, in the naval battle off the Spanish coast in 1805. It was presented by the 540-strong crew to Fife-born Lieutenant James Clephan after the conflict, a high honour bestowed upon an officer by his men. The flag is being sold by one of his descendants living in Australia. Clephan, who later went on to command his own ship, was one of the few men to have risen through the ranks and was greatly admired by his crew. The flag, measuring 7ft 4in x 11ft 7in, is made of 31 panels sewn together by the crew on board the ship. It bears a number of "battle scars" - holes caused by shot and shell splinter damage sustained during the conflict. It was treasured by his family, who kept it in a drawer to preserve it. Auctioneers expect the flag to fetch �10,000 to �15,000. Charles Miller, through his own auction house, is selling the piece in London on 21 October, Trafalgar Day. He said the flag was the only known surviving union jack from the battle. "I think it's hard to under-state the historical importance of this flag," he said. "This was the greatest naval action ever fought. The great thing about the flag is it's one of the most emblematic items you can get from Trafalgar. This is a bit of naval hardware that has actually served in the action." Clephan, from Scoonie in Fife, spent his early years as an apprentice weaver and went on to join the Merchant Navy. He retired in 1840 with the rank of captain and lived in Edinburgh for 11 years until his death at the age of 83. This flag appears to be a specimen of a type that we've seen drawn and painted a number of times: The four corners have small fields that each in themselves are traversed diagonally by red stripes bordered white. Those paintings, it would appear, are not mistaken representations, but are faithful representations of the actual flags of the time, even if they don't correspond with the symbolism behind the design. According to http://www.timesonline.co.uk/tol/news/uk/article6884574.ece the flag sold for nearly �320,000.